Summer is nearly a thing of the past and winter is on the horizon. Having the best winter boots that will protect your feet and keep them warm is the only option now. A great pair of winter boots is an essential part of your winter wardrobe. Whether it is just for getting to work before you change into your heels, or for being out and about with your family and friends, winter boots are the best way to keep your feet warm. View the Best Boots for Winter, Below. How to Wear Winter Boots? How to Choose Winter Boots? How to Clean Winter Boots? Selecting the pair that is best for you can seem a little daunting. Once you know what type of activities you will be using your boots for it becomes a little easier though. We have taken a long hard look at the options out there and selected the top ten winter boots on the market today. Let’s take a look at our top ten winter boots selection. We have reviewed the best of the best to help you make an informed decision on which boot will suit your needs. Sorel is one of the best-known brands for winter boots. They know what works to keep your feet warm and comfortable throughout the coldest of winters. This offering features a leather upper for great protection. The boot is rated to -40 degrees so no matter what kind of weather you are facing your feet will be warm and cozy in these boots. The removable 9MM Thermo Plus felt inner will not only keep your feet warm but also dry. 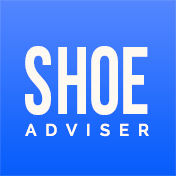 The rubber sole of the shoe is designed to wick away any water or slush you may encounter. The lugged sole makes for great traction and ensures that you remain secure no matter the surface you may have to traverse. The Sherpa snow collar adds to the warmth of the boot. One of the best men's winter boots on the market. The leather upper provides protection and is waterproof while the felt inner ensures that your feet are snug and comfortable no matter what the temperature outside is. The vulcanized rubber outsole wicks away water. Lugging ensures you get the best traction to remain secure on your feet no matter what hazardous surfaces you are traversing. 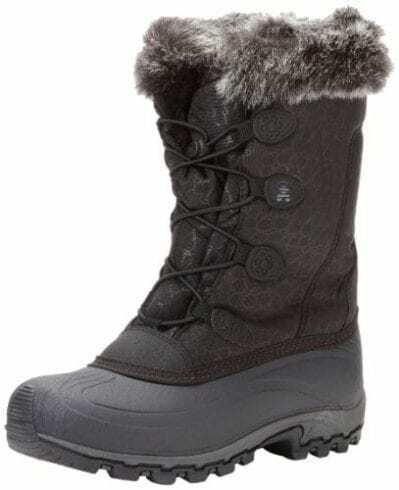 Sorel has produced one of the best winter boots for women with their Joan of Arctic Boot . The leather upper ensures that your foot is protected. It is also waterproof so you stay dry in any conditions. The removable felt inner of the boot ensures that the foot is warm and snug. A vulcanized rubber shell with seam-sealed waterproof construction ensures that no matter what activity you are participating in your feet will be protected, dry and warm. The faux fur snow collar adds to the look and style of the boot and also serves to keep the cold at bay. The D-ring laces keep your foot securely in the boot and ensure a great fit. The rubber lugs on the boot keep you sure-footed under any surface conditions. One of the best women's winter boots out there. Designed for the active women who like to participate in winter sports such as sledding. With a leather upper and vulcanized rubber shell and seam-sealed waterproof construction, you know your foot is secure no matter the conditions. These stylish winter boots will definitely hit the spot this winter. A superb winter boot at an affordable price is what you get here. A cushioned collar will ensure that you are comfortable and that you avoid any ankle discomfort when wearing the boot for long periods. The lace-up design of the winter boot ensures a great secure fit. The outsole is not only durable, but it is also designed to cope with any terrain. It provides light cushioning with the mesh-covered footbed and this also provides superb comfort. The boot is waterproof and also offer a microfiber heat reflective lining. A winter boot for women that provides all the protection and comfort that you need for those cold winter months. With an ultra-comfortable mesh-covered footbed which provides climate control. 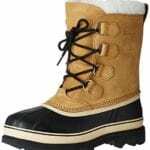 Cement construction for durability and flexibility and excellent traction this is one of the top winter boots for women. 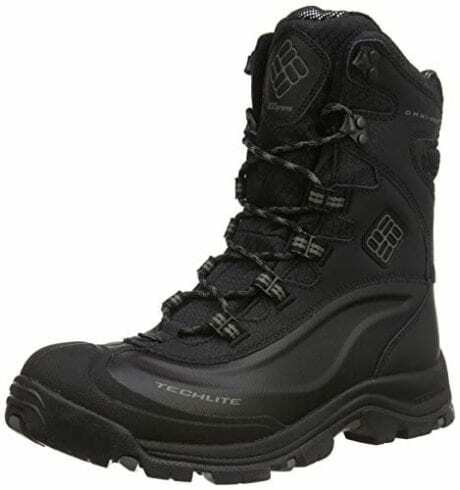 One of the top winter boots for men these are rated to -40 degrees and are sure to keep your feet warm and cozy no matter what the weather is like. The leather upper along with rubber ensure that the boot is insulated and waterproof. The lining of the boot is moisture wicking and the lacing system rustproof. The rubber sole is designed to protect your feet from cold and wet conditions underfoot. A cold-weather boot that will keep your feet warm and protected throughout the cold winter months. One of the best men’s winter boots on the market. Designed to keep your foot protected against cold and wet conditions. Perfect snow boot for men who like the outdoors. Rated for up to minus forty degree temperatures. Thinsulate insulation and an inner lining that wicks away moisture. Excellent traction, perfect for any terrain. A stylish women’s snow boot that does the business. It is rated to -25 degrees and will definitely keep your feet warm and snug. The seam-sealed waterproofing ensures your feet stay dry and insulated while the plush faux-fur collar looks great. The gusseted tongue of the winter boot for women ensures that the snow stays out of the boot. The Thinsulate insulation and removable footbed that also features anti-odor treatment are all features that keep your feet warm, cozy and fresh smelling. The lining is breathable and designed to wick away moisture. The PEAK traction sole ensures that no matter the terrain you will remain sure-footed. 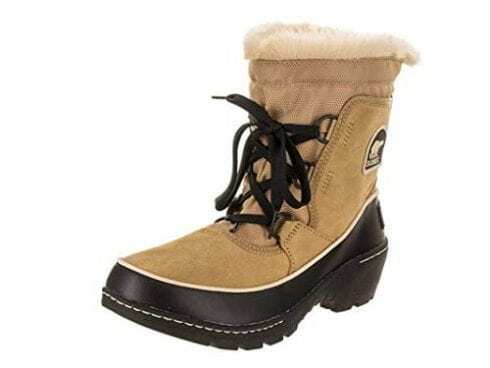 One of the top women's snow boots that are designed to keep your feet warm, cozy and protected in the snow. A gusseted tongue ensures that the snow does not creep inside the boot and the lining is designed to wick away any moisture. 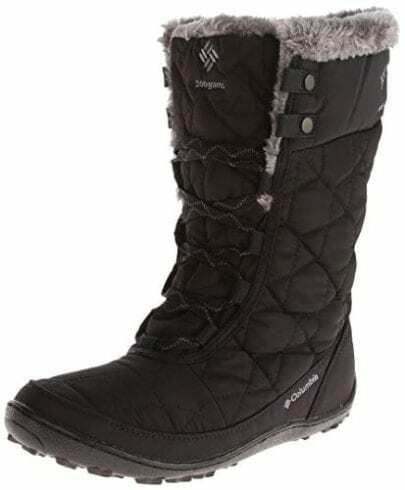 Stylish and with anti-odor protection this is one of the best women's snow boots on the market. A warm winter boot that features a seam-sealed construction to ensure that your foot remains dry. The ankle-high boot also features an Omni-heat reflective lining and excellent insulation against the cold weather. It has a lightweight midsole with excellent cushioning and excellent energy return. The outsole features Omni-grip to keep your secure on your feet no matter what the underfoot conditions may be. Rated to 25 degrees it is a great snow boot. The winter boot offers a great looking leather upper and is very durable. A stylish winter boot for men and one of the best cold weather boots designed. It is one of the warmest winter boots with Omni-heat, seam-sealed construction and 200g insulation. It offers a lightweight midsole so the boot will not weigh you down even in heavy snow. Offering great traction with a non-marking rubber sole. A genuinely stylish, warm winter boot for women. The geo-quilted boot with ghillie lacing also features a faux-fur collar. A waterproof construction and reinforced overlay ensure a comfortable and dry fit. The midsole is lightweight and the rubber sole is not only non-marking but also offers exceptional traction. With 200g insulation that will trap the heat with its reflective lining is one of the best boots for women to wear when out and about in the snow in winter. Columbia is one of the best boot brands for women and will ensure that your foot stays protected, dry and warm throughout those cold winter months. A lightweight winter boot for women to enjoy frolicking in the snow with. Great insulation, reflective heat-trapping lining, and seam-sealed waterproofing are not all you get. You also get excellent traction with the non-marking rubber soles. 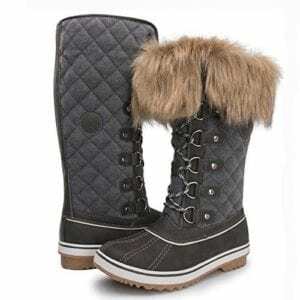 The style is important and the geo-quilted boot with ghillie lacing and faux-fur collar will look great outdoors or indoors. A lightweight winter hiking boot that is perfect for the outdoorsman to enjoy. It features M-Select DRY treatment to ensure your feet stay warm and dry. 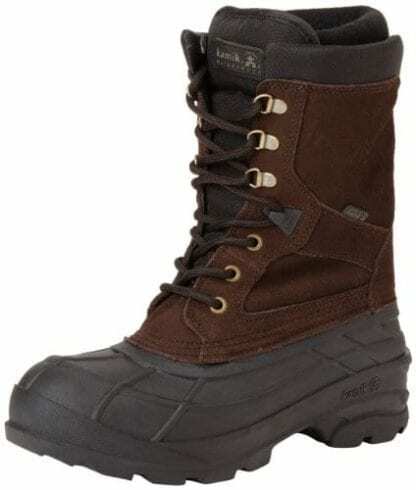 A great men's winter hiking boot that offers protection in the form of a shell bootie and color-blocked overlays. The midsole is molded EVA and the footbed is designed to offer maximum comfort. The outsole features M-Select ICE GRIP which ensures that you are always sure-footed no matter what the terrain you are traversing. The upper is leather, waterproof and highly durable. 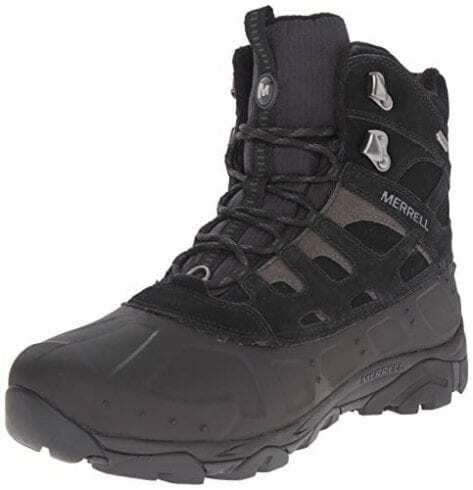 Merrell is one of the best brands of winter boots for men on the market. They deliver high quality, durable and comfortable winter boots for the men who enjoy the great outdoors. With molded EVA midsoles, ICE GRIP Outsoles and M-Select DRY treatment, this boot will ensure that your feet remain secure, protected and dry during your winter hikes. This cute winter boot has a suede upper. 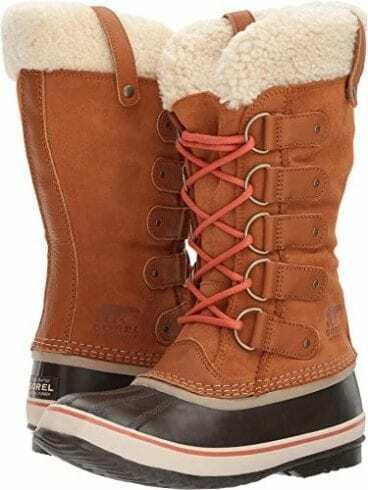 Another one from the Sorel range of winter boots for women. They are waterproof, and the two-tone suede and leather upper give them a very good appearance. The faux-trim with the microfleece lining make this one of the warmest, stylish winter boots on the market. The closure is lace-up to ensure that your feet are secured inside the boot. Toggle drawstring cinches the plaid flannel shaft. The heel is nice and chunky and the rubber sole provides excellent traction. You are sure to remain stable on your feet no matter the underfoot conditions you may encounter. A warm, stylish two-toned suede and leather winter boot for women. It features faux-trim with microfleece lining and a lace-up closure. A chunky heel and rubber outsole round out this women's winter boot. The Sorel Women’s Tivoli III Booties are an affordable warm boot that is perfect for both indoor and outdoor wear. One of the best men’s snow boots available. North Face is named after the most difficult side of a mountain to climb. These boots are waterproof and insulated. They have IcePick soles to ensure that you hold your grip on the ice when walking. The leather upper is waterproof and BLC-compliant. The entire shoe is designed to keep your feet warm, dry and protected even under the harshest conditions. The injection-molded TPR shell is waterproof and anatomically engineered to provide extreme comfort. The lace-up closure ensures a secure fit. A 200g Heatseeker insulation makes sure no matter the weather conditions your feet will remain warm. Built-to-last warm and comforting these are exceptional snow boots for men. They are insulated, waterproof and sturdily constructed. Anatomically engineered to provide the most comfortable with a TPR shell that is injection-molded. 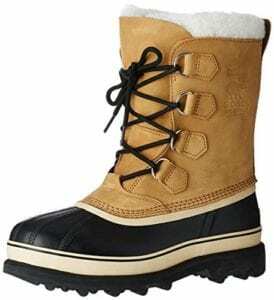 One of the best boots for Alaska winters, these are also one of the most popular snow boots. When you are looking to purchase your winter boots, you may think it will not be a difficult decision to make. However, it can be a little daunting with all the different types of boots on the market. Some are meant to be more stylish than practical and some are meant to take on those winter hiking trails. There are a few basic rules to follow when you are considering which boot to purchase. First and foremost is the fit and comfort of the boot. Ensure they are waterproof, warm and comfortable. Traction is another very important part of a winter boot and critical to your decision on which one to select. Let’s have a look at some of the most important factors a little closer. If you are looking for the warmest winter boots you need to ensure that you get the best fit. You should cater to the shape and size of your foot when selecting your boot. If you have larger feet and wider feet than normal you may need to consider a boot with a wider last and broad fit. The Sorel Caribou is one such winter boot that would suit your requirements. Gender also plays a role when looking at the size and fit of your boot. Women will have smaller feet and less wide feet than her male counterparts. Boots are designed to cater for these differences and it is important that you consider this when selecting your boots. Insulation is one of the main reasons you will select a winter boot over a normal boot. The insulation on these types of boots is designed to keep your feet warm in the coldest of weather. The insulation in these bootstraps the heat and keeps your feet warm. This is a major consideration when selecting your winter boot. Keeping your feet dry is imperative, this is because water conducts the cold a lot faster than air would. You will also find that any water you may come across will be very cold. The boots need to be protected from water outside the boot and also inside the boot. Protective boots are especially important for motorcycle riders. A moisture-wicking lining is perfect to ensure your foot remains dry inside the boot. Leather and other waterproof materials are perfect to ensure that your boot keeps the water out and away from your feet and socks. The type of closure on your winter boot is also important. It will have an impact on the fit of the boot and security the boot offers when you are walking. Lace-up closures are the best type of closure for winter boots. You can easily tighten or loosen them as you wish and they are perfect for any kind of fit. Insulated winter hiking boots often feature speed lacing eyelets. The final thing to take into consideration when selecting your boot is their weight. Boots will be their nature be heavier than your athletic shoe. The weight of the winter boot is important when you take into consideration what you are going to be using your boot for. 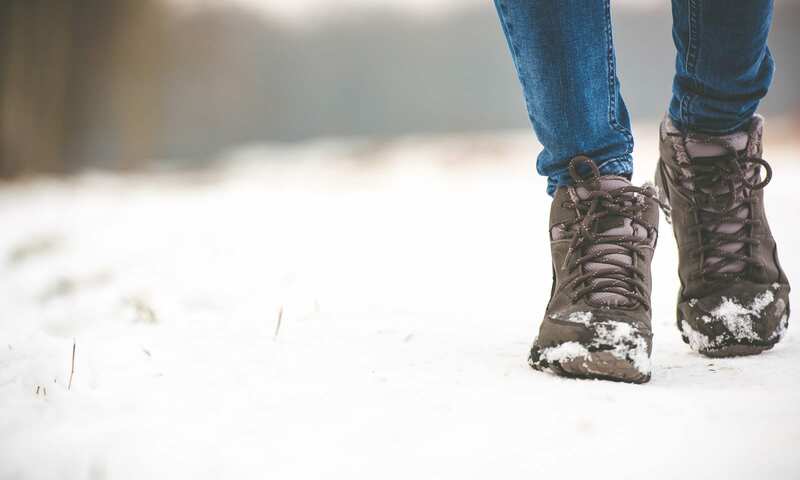 If you have a heavy winter boot, then hiking or walking in them could be difficult. However when you are simply shoveling snow from your driveway then heavy boots are not an issue. The sole of the boot provides the traction. This is important as walking on icy surfaces can be hazardous. Good traction on your winter boots is essential and more so depending on what activities you are intending to do. If you are going to be hiking you need a sole that is not only flexible but also provides great traction. Wearing winter boots is a style all of its own. There are a lot of boot varieties on the market. Over-the-knee, leather, suede and a number of different lengths. You can wear them with jeans, other pants or even long or midi dresses. There are no set rules on how to wear your boots but there are a few guidelines. Always make sure you are wearing proper socks that will keep your foot wrapped within your boot. If you are wearing jeans with a shorter boot, then cuffing your jeans could work well. You can also tuck your pants into your boots. How you wear your boots will also depend on the activity you are wanting to do. 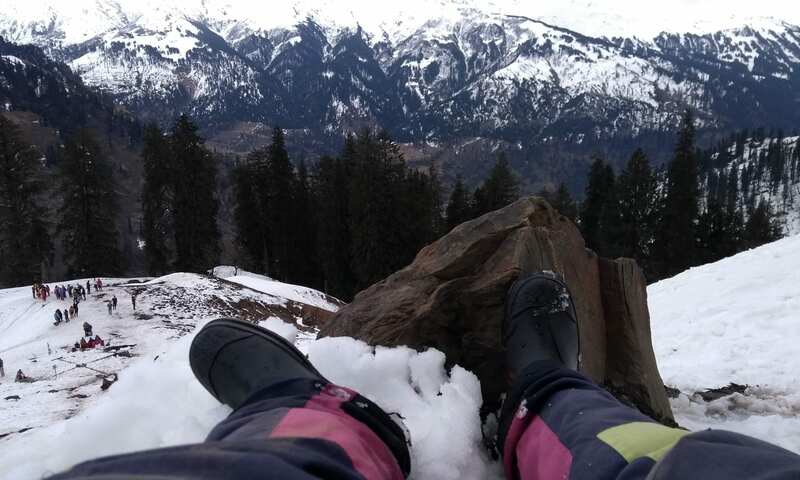 If you are going snowboarding, make sure your pants do not infringe on your pants. If you are skiing the same applies as if will not be great if your boots are dry but your pants are soaking from sloshing in the snow. Choosing your winter boot will depend on what you need them for. 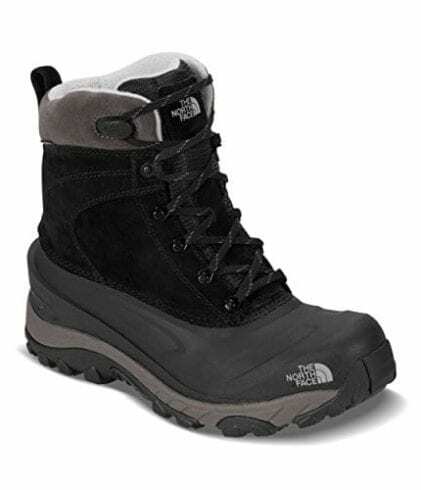 If you are looking to go on winter hikes then a lightweight, well-insulated boot is perfect. If you are looking to do heavy hiking or braving areas that have ice covers, then one with extreme traction is paramount. If however, you are simply looking for a warm, waterproof boot that looks stylish then a simple winter boot with fur collars are great. There are many different ways to clean your winter boots. It will depend a lot on what your boots are constructed from. If they are leather, then you need to use a leather shoe brush and body soap to get the salt stains out. Suede boots are sensitive and need a gentle approach. Wipe away the dirt and then brush quickly in the same direction as the suede. Always spray on suede protector once clean. Buying a pair of winter boots is not as easy as you may think. Top rated winter boots are those that suite the purpose you are going to be using them for. If you are looking for snow boots, winter hiking approach shoes or cute, stylish winter boots there are a lot of them on the market. 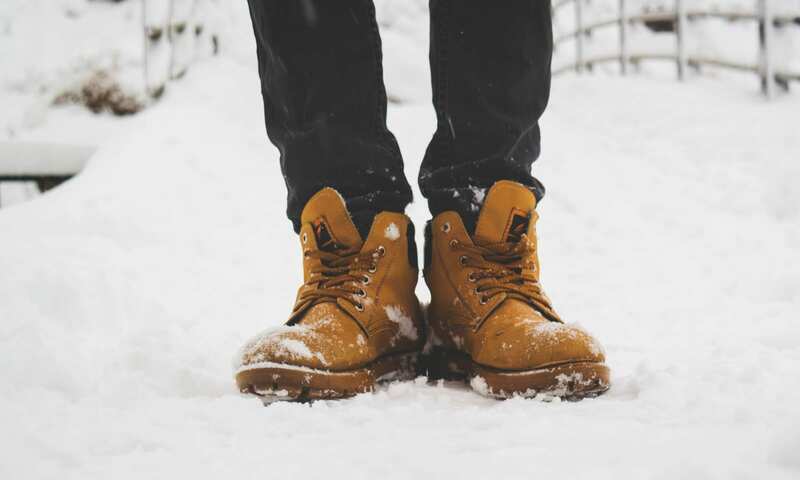 No matter which type of winter boots you are looking to purchase, there are a few things to consider, size, weight, gender, insulation and water resistance being just some of the criteria you need to look at. Read the online reviews, customer reviews and try a few on before making your decision. Always make sure your winter boots have the right features for the activities you have in mind. Also, make sure that the winter boots you select are suited to the weather conditions you will be experiencing. The Mayans were the first people to make rubber boots. They used to dip their feet into a mixture of latex from rubber trees and juice from morning glory vines until the layers hardened giving them their own bespoke rubber boots. We hope you enjoyed our article on "10 Best Winter Boots in 2019", if so, please share and rate it.